Flowering habit at Omaopio, Maui, Hawaii (USA). May 18, 2009. Origin and Habitat: Senecio talinoides subs. mandraliscae, was originally described by Tineo from a plant growing in the Lipari Island (Sicily, Italy), but the origin of this plant is uncertain and a may be a garden hybrid. 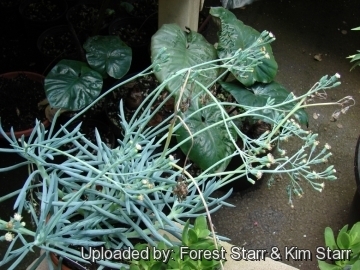 Description: The blue chalk sticks, Senecio talinoides subs. mandraliscae, is a mysterious taxon, probably hybrid, distinguished from the standard Senecio talinoides by a marked juvenile phase characterized by short branches and short leaves more similar to those of Senecio citriformis 5-8 times as long as wide, later elongating. It is the bluest of the "talinoides" with a waxy white coating that protects it from hot, sunny, and dry conditions. Habit: It is a glabrous, pruinose, evergreen perennial erect or semi-trailing succulent shrub typically less than 40 cm tall and 60 (or more) cm wide with leaves angled upward from the ground. It is the lower growing of the subspecies. Stem: Branched, long, tubular, stout. Fleshy, erect becoming procumbent and often rooting at the nodes and brittle, 5-10 mm in diameter, usually short but occasionally up to 150 cm long in cultivation. Leaves: Encircling the trailing stems or reduced to tufts at the stem tips, long fusiform to cylindrical-terete or laterally compressed, erect or arching, very fleshy, with a long mucro, 7-15 cm long, 8-13 mm in diameter, glaucous-grey with darker stripes, but can rub off the pruine and it's a blue-green beneath. 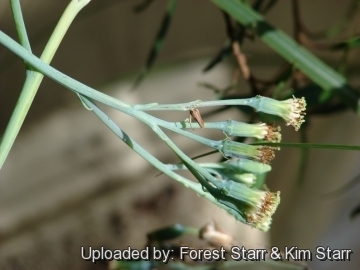 Inflorescence: Corymbose or paniculate with 10-25 small ray-less capitula (flower heads) held above the foliage. The outside of the capitulum is blue-green, and the small flowers within are white or off-white and not showy. Capitula 5-9 mm in diameter. Involucre 9-12 mm, with 2-5 supplementary bracts. Phyllaries 6 – 8. Disc florets 7-20. Fruits: The fruits called achenes (or cypselas) are long and thin and have a conspicuous feathery pappus attached that functions as a "parachute" which enables the seed to be dispersed by the wind. Chromosome number: The chromosome number of Senecio talinoides subs. mandraliscae is variable ( 2n = 30 and 2n = 100). Senecio talinoides (DC.) Sch.Bip. : (subsp. talinoides) Similar to Senecio talinoides subsp. mandraliscae but with finer texture. Distribution: Western Cape, Karoo. Senecio talinoides subs. aizoides (DC.) G.D.Rowley: has 2-8 capitula per inflorescence, about 12 phyllaries and 25-30 disc florets. Distribution: Western Cape, South of Albertina. Senecio talinoides subs. chordifolius (Hook.f.) G.D.Rowley: has the longest leaves 17-18 cm long and dropping. Phyllaries about 17. Distribution: Western Cape, Prince Albert Distr. Senecio talinoides f. cristatus: crested form. Senecio talinoides subs. cylindricus (A.Berger) G.D.Rowley: has terete leaves, 10-15 capitula per inflorescence, 6-8 phyllaries and 7-20 disk florets. Distribution: Eastern Cape, East London and Alexandria Distr. 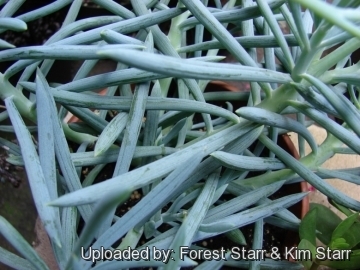 1) Forest & Kim Starr “Senecio mandraliscae (Blue finger)”. Plants of Hawaii. <http://www.starrenvironmental.com>. Web. 27 Sep. 2014. 9) San Marcos Growers contributors “Senecio mandralicae (Kleinia)”. San Marcos Growers <http://www.smgrowers.com>. Web. 27 Sep. 2014. Cultivation and Propagation: This plant grows as a groundcover and makes a very ornamental pale blue colouring in full sun in warm climates. It's fresh new winter growth provides extraordinary form and colour contrast in the landscape when placed either with other succulents (e.g. yellow Sedum) or in a mixed planting to contrast with anything orange, from terracotta pots to California poppies. It also pairs beautifully with red-leaved aloes, lavender 'After-glow' echeverias, fire sticks (Euphorbia tirucalli`Sticks on Fire'), elephant's food (Portulacaria afra f. variegata), and burgundy-leaved “Aeonium arboreum var. atropurpureum cv. Schwarzkopf (Zwartkop)”; and with nonsucculent companion plants such as ivy geranium, parrot's beak, and African daisies (Gazania species). It is drought tolerant, but will accept irrigation. Similar in appearance but not as common is Senecio serpens, which is a better choice, if you can find it, for small beds and containers. 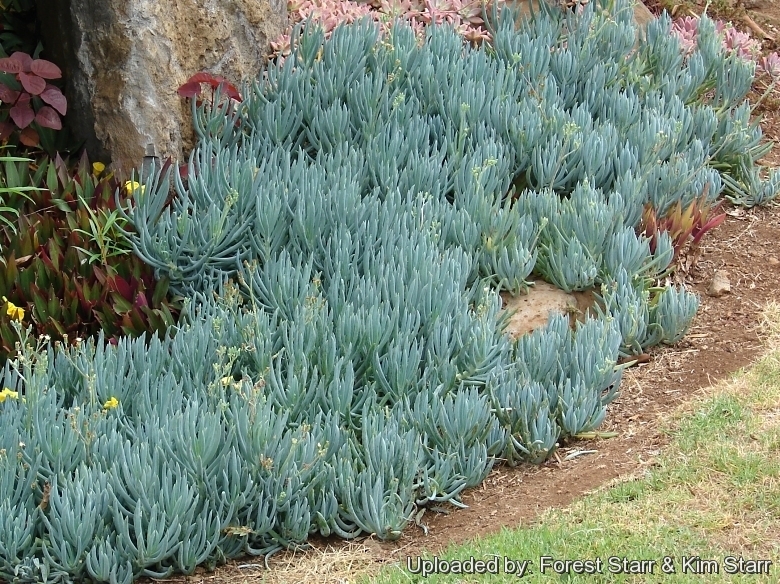 Leaves are less than half the length of those of Senecio mandraliscae. Soil: It requires a very free draining enriched soil, mildly acidic to mildly alkaline but is very tolerant of poor soils. Watering: It needs moderate water during from spring to autumn, keep rather dry in winter or the plants may rot at the base. But it adapts to different growing conditions from extreme heat and drought, to high moisture as it has a low rot potential. Exposition: They seem to do well in part shade such as at the base of trees, but thrives also in hot sunny positions and will tolerate coastal conditions. Frost Tolerance: It is cultivated in open air in the tropical and warm Mediterranean climate, with temperatures which it is good to keep over the 5°C, best 10-12°C, but can withstand light frost for short periods if very dry (hardy down to -2 to -10º C, even if with damage to the foliage) in these situations it will better resist if sheltered by the winter rains, seen that the humidity and low temperatures render it more sensitive to rottenness. Plants in containers however, suffered major leaf loss. USDA Zone 9b to 12. Wind and salt tolerance: Tolerates well high wind and second line salt wind. Maintenance: The flower stems need to be removed to keep a tidy appearance. These species do tend to get sort of leggy, which is particularly a problem if grown as a potted plant, and yearly trimming back is often necessary. Cut back in late summer. Because old leaves fall off and new ones grow at the ends of the stems, Senecio mandraliscae becomes lanky unless made to branch. Propagation: It is easy to propagate by cuttings in late spring to summer, just take a cutting of the plant let it dry for 1 or 2 weeks and stuff it in the ground (preferably dry, loose, extremely well draining soil). Once established this pant provides a source of cuttings to give away or to fill gaps in the garden.